Behind-the-scenes videos reveal a crane, a drone, and dozens of screaming teenagers. Drake's new song "God's Plan" from the Scary Hours EP has enjoyed a record-breaking streaming run and a No.1 Billboard Hot 100 debut since its release. 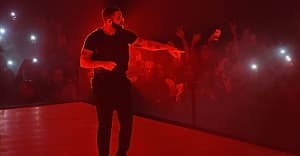 Now, it seems as though the rapper is capitalizing on the song's momentum quickly: social media was flooded on Monday afternoon with videos of Drake filming what appears to be a "God's Plan" music video at Miami Senior High School in Florida. In the footage Drake is shown on a large crane, filmed by a drone, and filming scenes with the high school students serving as extras. Check out some clips below. ABC 10 News confirmed the visit, and reported that Drake gave a $25,000 donation to the school and promised that every student would get a special Drake-designed uniform.